Advancement in Ayurvedic education, research and practice is highly appreciable in present times due to vast awareness among public not only in India but also in abroad. In present times, students faced competitive examinations in every step of Ayurvedic education, i.e. B.A.M.S. M.D. (Ay) and Ph.D. (Ay) to obtain admission. Even after completion of highest education in Ayurveda one more competitive examination will be faced by the Ayurvedic doctors for getting services as medical officers, lecturers through UPSC and all state Public service commissions etc. In this competitive sphere for getting success, there should be intensive, critical, analytical vast study of the subject covering the most important and useful topics, which are commonly asked in competitive examinations. In this connection most of the aspirants are in dark in respect of the type of questions to be asked in competitive examinations. 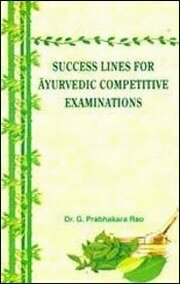 Hence this book is designed to meet the precise requirements of students as well as competitions of Ayurveda in light of present trend with update given multiple choice questions in different previous competitive examinations of Ayurveda for the last 3 decades. Bibliographic Information: xiv+955p., Tables; Index; 24cm.